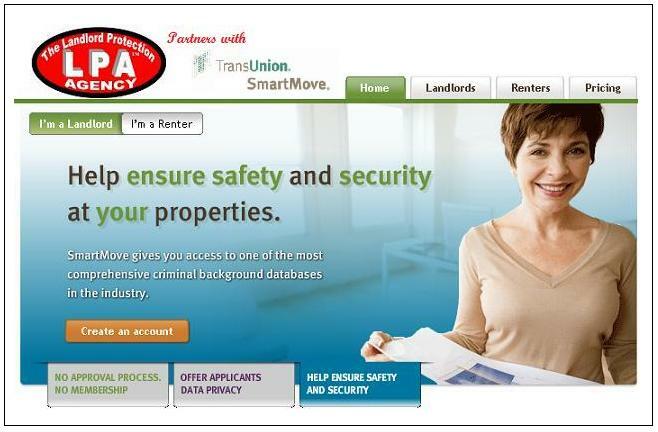 TransUnion Credit Bureau has partnered with The Landlord Protection Agency to provide an alternative option in on-line tenant screening. Private landlords who choose to avoid the qualifying process required for establishing a direct access account for tenant credit reports now have another way. How does SmartMove work for Landlords and Tenants? By accepting the request, the applicant initiates the release of his or her credit and criminal record information to the landlord through SmartMove. By declining, he or she cancels the rental application. Either way, no personal identifying information such as Social Security number is released to the landlord. If the applicant accepts the request, the landlord receives credit and criminal history information and a SmartMove "leasing recommendation" to assist them in making a decision on whether to accept or decline the applicant. Renter is notified of the landlord’s decision. No monthly service charges, set-up fees or other hidden costs. Simply create an account and use it only as often as you need it. Choose who pays SmartMove can be paid for by either tenants or landlords - you choose who makes the payment each time you request a screening. Either way, billing is secure and online.